Fans of tactical roleplaying games are probably already intimately familiar with the Fire Emblem series. After all, it is one of Nintendo’s longer running series in Japan, having made its debut for the NES back in 1990. It wasn’t until 13 years later that the series would make its U.S. debut on the Game Boy Advance, but nonetheless fans of the genre have flocked to Fire Emblem games due to their excellent story lines, gameplay depth and challenge. However, even those with little knowledge of this strategy RPG series are at least somewhat familiar with Fire Emblem, thanks to the inclusion of various characters in the Super Smash Bros. games for the Nintendo GameCube and the Nintendo Wii. One of those Smash Bros. veterans happens to be the star of the forgotten GameCube classic Fire Emblem: Path of Radiance. His name is Ike, and this 2005 release marks the first half of his two-part saga (Ike’s storyline concluded in Fire Emblem: Radiant Dawn for the Nintendo Wii). As the game opens, Ike is a trainee member of his father’s mercenary group, but as so often happens in games like this, he soon experiences tragedy and finds himself embroiled in the center of a global conflict. Over the course of his journey, Ike experiences conflicts between different cultures and races, while ultimately working to overthrown an evil dictator bent on conquest. It may seem like fairly standard RPG fare, but it is in the plot’s excellent execution where this Fire Emblem title shines. In terms of gameplay, Path of Radiance doesn’t stray too far from previous Fire Emblem games, and considering the traditionally high quality of the series, that is definitely a good thing. For the uninitiated, what this means is that it features selectable difficulty levels, as well as turn-based strategic battles somewhat similar to a chess game in which the pieces can level up and grow more powerful over time. During each battle, the player is prompted to place a certain number of warriors onto their side of the field, and they square off against an opposing force. The conditions of victory can vary. For example, sometimes all enemies must be defeated, sometimes units need to survive a certain amount of time, and sometimes a particular soldier must reach a predetermined destination. This variety is one of the things that definitely make the Fire Emblem series so addictive. Other series staples are also featured in Path of Radiance. Weapons have a limited number of uses before they break, and permanent death results for any character unfortunately enough to fall in the midst of battle. There are more than two dozen chapters to the game, each containing at least one battle, so there’s easily 30-40 hours of depth here. One new feature that Fire Emblem rookies will appreciate is the addition of bonus experience points, which is awarded following victory and can be distributed to different party members in order to make them more powerful. This feature, combined with the ability to choose an easier difficulty level, helps to make Path of Radiance a good gateway game for those just looking to get into the series. The graphics in Path of Radiance were a huge leap forward when compared to other games in the series. Characters and maps are larger and more detailed, and the game even makes use of a handful of CG cut scenes to help tell the tale. Still character portraits are used during pre- and post-battle conversations. They look nice, but in some ways, it seems like the game could have offered more. The same is true when it comes to the sound department. The music is decent, but ultimately forgettable, and the minute amount of voice work included is rather muffled and difficult to hear. Still, these are minor complaints on the whole. For a strategy game, Path of Radiance looks and sounds good enough to more than get the job done. 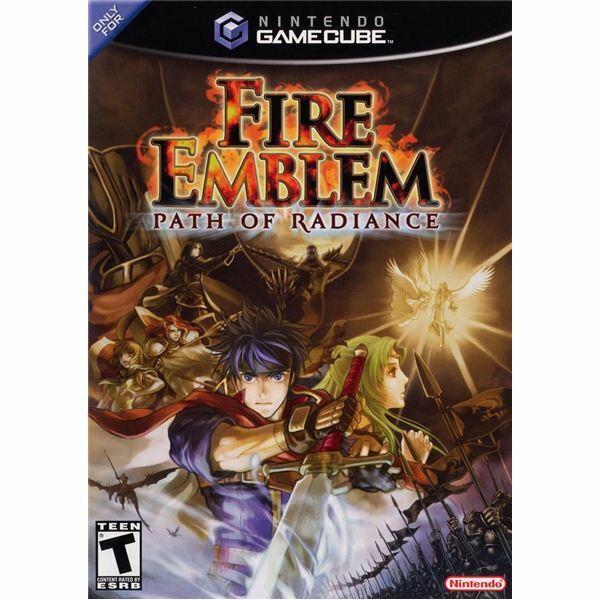 Fire Emblem: Path of Radiance remains one of the higher-priced GameCube games, regularly going for $30 or more used at game retailers and online. It’s not hard to see why. Part of the reason is because of the fact that the title is Wii compatible, allowing fans to pick up and play the game on their current generation hardware. Part of it is because of a data transfer option it shares with its Wii sequel, Radiant Dawn. The primary reason for the high demand, however, is that this is an absolutely fantastic, addicting tactical RPG and a worthwhile purchase for anyone who enjoys the genre. Recommended for fans of strategy and roleplaying games, i.e. titles like Final Fantasy Tactics and Shining Force.